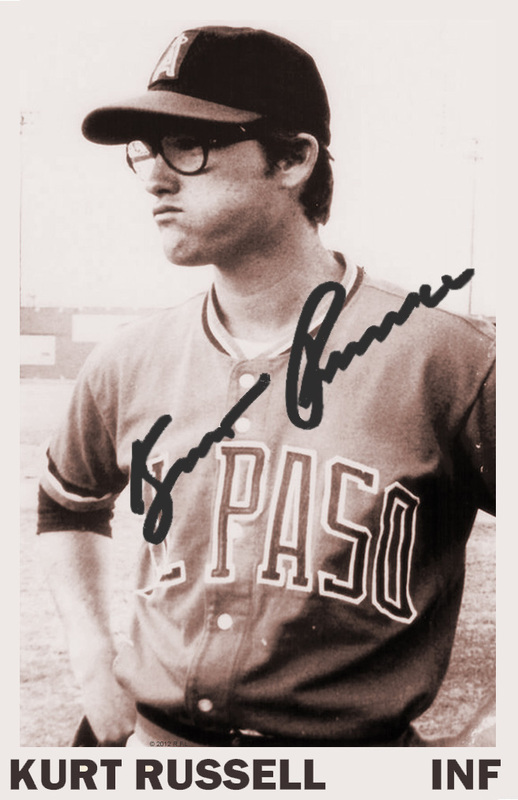 Today I found out Kurt Russell was a minor league baseball player until an injury ended his career. While the Russell family is mostly known for their acting, “Baseball is really the family business that nobody knows about because our other business was sort of out there in the public and seen by a lot more people,” said Kurt Russell. Kurt’s father, Bing Russell, who is perhaps best known for his role as deputy Clem Foster in Bonanza and Robert in The Magnificent Seven, also played in the minor leagues, playing in 1948-1949 for the Carrollton Hornets. Besides acting, Bing Russell went on to own and run the Portland Mavericks baseball team. I played ball from when I was a kid. It’s just always been in my family. My dad had minor league teams. My great grandfather was a great ballplayer. I played it as long as I could. And I always thought I could do both. I wasn’t really serious about acting — I was serious about baseball. I don’t know if it was more important to me than acting, but I was a young man… and I had geared up to play pro ball from the time I was 13 or 14. The acting was something that just came along. But I made good money acting, so it wasn’t something that I was just going to put aside and pretend it didn’t exist. He was scouted by the Angels, Cardinals, Twins, and Giants, but the teams were all somewhat reluctant to sign him due to concerns (that ultimately proved valid) that he’d only be a part time player, taking time off on occasion to continue acting. For instance, in 1971 when he signed with the Angel’s Class A Bend Rainbows club as a switch hitting second basemen, he reported late to spring training as he was still filming Now You See Him, Now You Don’t. After playing for the Rainbows, he went on to play for the Walla Walla Islanders in Washington in 1972 and then the Portland Mavericks (owned by Bing Russell), and finally, in 1973, he played for the AA El Paso Sun Kings. I used to throw batting practice a lot, and with some injuries on the team, I was playing all the time which I hadn’t been earlier, and with throwing batting practice, I think my arm was somewhat tired. But I got hit high on a double play just as I turned it, and it surprised me because we were way ahead in the game and I thought the runner would turn off to right field. So it was my fault. I kind of lackadaisically came across the base and he hit me high. I didn’t know what happened but the next thing I knew I was lying flat on my back. It didn’t really hit me how bad it was hurt at the time. I went out that night and played air hockey and I began to feel my arm bothering me. The next day throwing batting practice it didn’t feel right and over the next week it just got worse. Frank Tanana told me, “I think you’ve torn your rotator cuff.” I said, “What are you talking about?” I didn’t know what a rotator cuff was, it wasn’t that well known back then. Frank said, “Yeah, I know what that is. I think you’ve torn it and I think you might be done.” And I was like, yeah, sure. He was supposed to return to play for the Sun Kings, but ended up playing back with the Portland Mavericks. During this stint with the Mavericks, besides acting and coming off a major injury, he was also named the VP of the Mavericks, making him the only professional baseball player at the time who was also an executive of a professional baseball team. Whether it was the injury or just having way too much on his plate between rehabbing, acting, and helping out with the business side of things with the Mavericks, this all resulted in his worst season by far, batting .229 with a .253 SLG in 83 at bats. Needless to say, this spelled the end of his career as a professional baseball player. After a brief 1 game, 1 at bat curtain call in 1977 with the Portland Mavericks, Kurt Russell ended up with minor league stats as follows: .292 batting average, .361 on base percentage, 2 home runs, and managed to walk almost as much as he struck out at 38 BB to 41 SO in a total of 356 at bats. He also made the Northwestern League All-Star team in 1971. Also, if you discount his post-injury at bats, he had a career minor league batting average of .313. Kurt Russell’s nephew, Matt Franco, was a major league baseball player from 1995 to 2003 and also played in Japan from 2004-2006. While never exactly a great player in the major leagues, Franco does have the distinction of holding the record for most pinch hit walks in a season with 20. While the credits stated that George P. Cosmatos was the director of one of Russell’s (and Val Kilmer’s) best films, Tombstone, in fact, Kurt Russell was the director and Cosmatos was a “ghost director”. Russell revealed that little tidbit after Cosmatos died in 2005, at which point Russel was no longer bound by his promise to keep that secret as long as Cosmatos was still alive. George Cosmatos also ghost directed Rambo: First Blood Part II. Both Michael Richards (Kramer on Seinfeld) and Kurt Russell graduated from Thousand Oaks High School in California. Bing Russell as the owner of Portland Mavericks has the distinction of hiring the first female general manager as well as the first Asian American general manager in professional baseball history.